Bangers and mash must be one of the all-time great comfort foods which for me instantly brings back memories of childhood. This weekend I decided that instead of a Sunday roast I would make these lovely big rustic homemade sausages with some cider and mustard gravy. 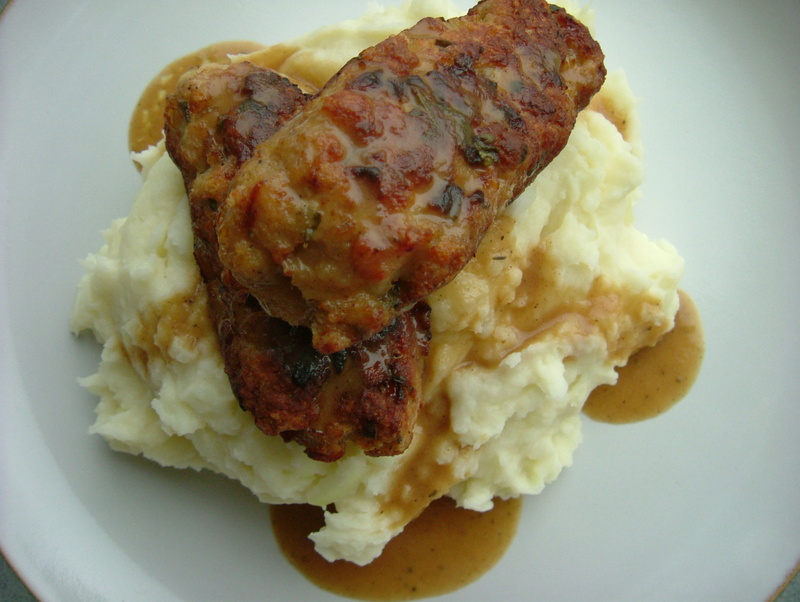 This is a great way to feed the family – your sausages have a high meat content and you can control exactly what goes in to them and they are also very economical – I used four boneless loin chops which yielded 11 (if I had been more careful there could easily have been 12) good sized sausages and I found 2 was enough for me but my husband demolished 3! I served the sausages with creamy mash, oven baked carrots and my first sprouts of the season – delicious! First sauté the finely chopped onion in a little olive oil over a medium heat until lightly golden brown, but not too dark. Once cooked remove the onions from the pan in to a large bowl and allow to cool. 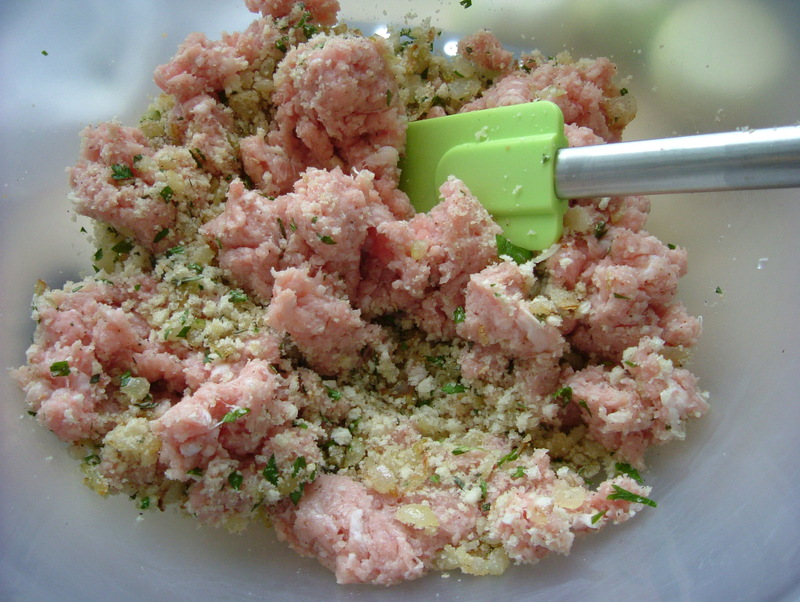 Once the onions have cooled add the breadcrumbs, finely chopped herbs and a good pinch of salt and pepper and mix together. Put the four chops in a food processor together and pulse until the mixture resembles coarse mince, make sure you do not pulse too much that it becomes too mushy. Remove from the processor and add to the bowl with the breadcrumb mixture together with the beaten egg and using a spatula or large spoon mix all of the ingredients together thoroughly. If you wish you can at this stage fry a tiny bit of mixture until cooked through and taste just to check that you are happy with the seasoning. 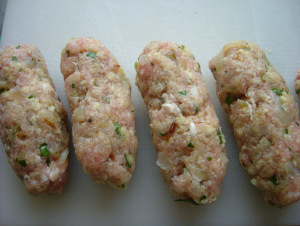 Shape the pork mixture in to rough sausage shapes and place on a suitable board or plate and refrigerate for around 20-30 minutes, this will help them to stay together when frying. Preheat the oven to 180ºC. Heat a tablespoon of olive oil in a non-stick frying pan and fry the sausages for a few minutes on each side until nice and golden. You will need to do this in two batches. 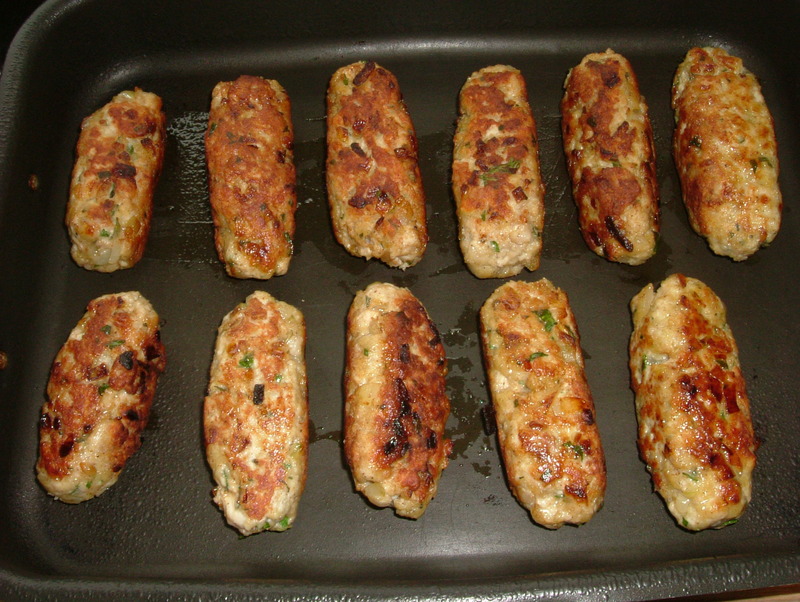 Remove the sausages when coloured to a baking tray and when all have been panfried place in the oven for around 15-20 minutes until cooked through. Use the pan that you fried the sausages in to make the gravy. Add a glug of olive oil and heat on medium, then add in the sliced onions and fry until golden and soft, gently scrapping the meaty residue from the bottom of the pan. Sprinkle the onions with the flour and stir, then turn up the heat and add in the cider and mustard. Allow to simmer until the liquid reduces by half. Add in the water and continue to simmer for a few minutes. Season with salt and pepper and taste. 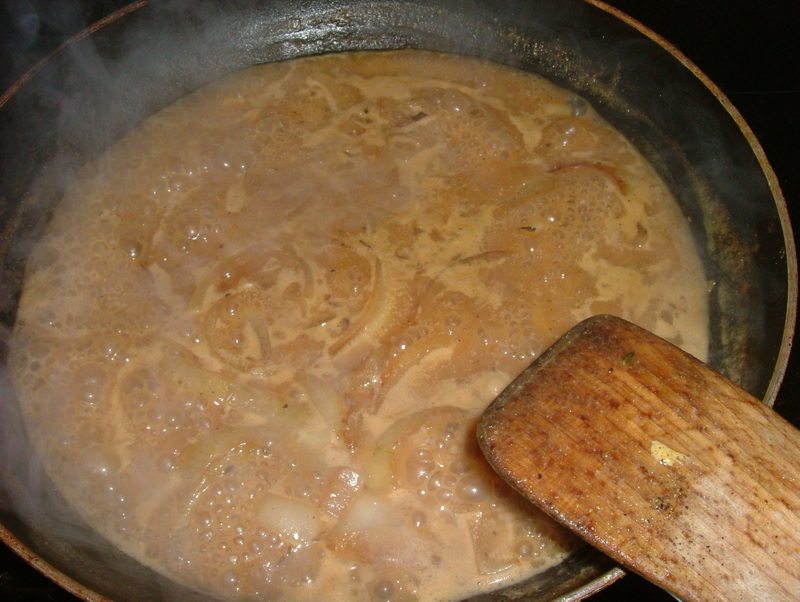 Then strain the gravy through a sieve into a saucepan and keep warm until you are ready to serve. Roast Irish Pork Loin with Cider GravyIn "Dinner"
Toad in the HoleIn "Dinner"
Hello Imen! These are really simple but very meaty so if your boys are anything like mine then they should go down a treat x I forgot to mention it in the post but I also served some baked apple rings on the side too. They look really good, will definitely try them out soon. Also, I really like the idea of knowing exactly what’s in the sausages! these look fantastic. 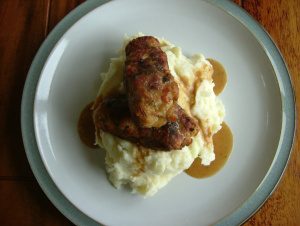 already thinking I may have bangers and mash for dinner tonight – perfect comfort food! Ah thanks. They are a bit on the ‘chunky side’ :) but perfect Autumn food. I’m a sucker for sausages, and this looks fab! These look fab and much easier than I would have thought. They are going on my ‘to try’ list. I seem to have drooled a little on my keyboard. Oopsy. Heehee :) between this and the coddle people are going to start thinking I have a sausage fixation. 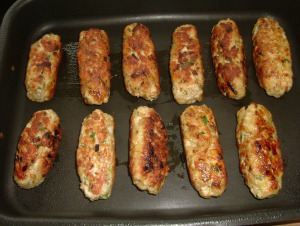 can i use minced pork that can be bought in the shops?I dont have a food processor at home, unfortunatelly, but I would LOVE to try the sausages. Thanks! Hello and welcome :) yes absolutely use pork mince if you can get it – it would probably have a bit more fat which is good for keeping the sausies nice and succulent. Hope you like them! Hi Glutton, I made these for dinner this evening. We had been really missing nice pork sausages and unless we were willing to drive great distances to the Irish shops or import them from New York we were out of luck. They were divine. The boys have just told me that they are the nicest thing we have had for dinner since we moved here. Yum yum ! Well I have no problems getting anything like that but its the simple everyday stuff we just can’t get and miss so much !